Making it to the finish of the 12 Hours of Sebring is one of the biggest challenges in sports car racing, and despite both of its cars encountering major setbacks during the race, the cars of Mazda Team Joest made it to the finish in Saturday’s 12 Hours of Sebring. 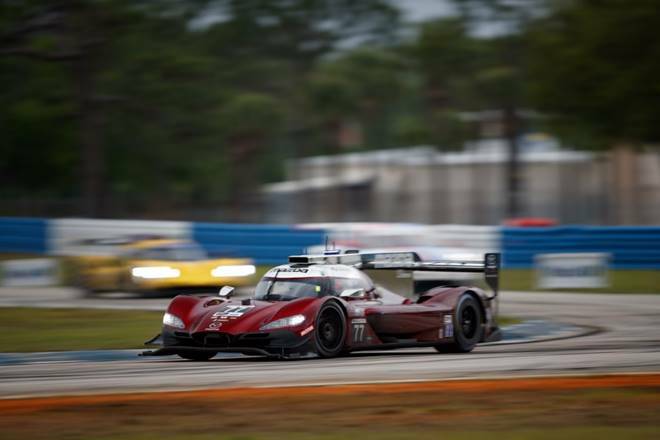 The first challenge for the drivers of Mazda Team Joest came in the form of the weather, as a heavy rain passed through Sebring International Raceway during the first part of the day, causing the race to start under a full course caution. When the race finally got underway, Tristan Nunez, who had qualified the No. 77 Mazda RT24-P in second position, stormed to the lead with a bold pass on the outside of Sebring’s turn one. However, the challenge by the No. 77 came to an end when an electrical problem caused the car to stop on course in the second hour of the race. The car ultimately returned to the race and was classified in eleventh position at the finish, but Nunez set the third-fastest lap of the race before the checkered fell. The No. 55 Mazda RT24-P of Jonathan Bomarito, Olivier Pla and Harry Tincknell went down one lap in the early stages of the race but mounted a charge through the field to make up the lap and then lead the race. Just before the halfway mark, Bomarito had an incident which forced him to bring the car for an unscheduled stop for repairs. After losing three laps, the driving trio was able to make up one lap on speed, punctuated by Harry Tincknell setting the fastest lap of the race in the tenth hour with a time of 1:47.472. However, a lack of full-course caution periods minimised the team’s opportunities to make up more laps and the car took the checkered flag in sixth position. The next round of the IMSA WeatherTech SportsCar Championship will be the Bubba Burger Sports Car Grand Prix at the Grand Prix of Long Beach in Long Beach, California on April 13.